The purpose of this report is to explain what I did and learned during my internship period with the Santa Clara County Library District (SCCLD) as their social media intern. The report is also a requirement for fulfillment of San Jose State University School of Library and Information Science’s Virtual Internship program. The report focuses primarily on the student learning outcomes (SLOs) and will include a breakdown of activities and tasks performed during the internship period and how they relate to the achievement of the SLOs. SCCLD consists of 7 community libraries, 1 branch library, 2 bookmobiles and an online library. They serve the areas of Santa Clara County in California including: Campbell, Cupertino, Gilroy, Los Altos, Lost Altos Hills, Milpitas, Monte Sereno, Morgan Hill, and Saratoga. They serve a population of 412,732 with a rate of 52% being current library cardholders. As an intern with the Santa Clara County Library District (SCCLD), I was working with Megan Wong, the virtual library manager, to develop procedures and policies to help further the presence of the library in multiple social media platforms. SCCLD is present on 7 social media channels including: Facebook, Twitter, Instagram, Pinterest, LinkedIn, YouTube and 44 library blogs. I chose to apply for this internship based upon my interest in the use of social media in organizations such as libraries. I also lacked professional experience in a public library, as all my experience is in academic libraries and SCCLD provided me both options. Prior to beginning my internship I worked with the internship supervisor, Megan Wong, and developed a set of SLOs that would outline the tasks and responsibilities to be accomplished during the internship period. Effectively identify, monitor and respond to the community audience formed around the library’s social media by reviewing previous posts and audience response on social media platforms (Facebook, & Twitter) and attending Reader’s Advisory meetings (virtually). Learn and practice best social media practices through hands on use of platforms including scheduling posts and daily interaction on forums to increase traffic on Santa Clara County Library district social media platforms; including Facebook, LinkedIn, and Twitter. Formulate a social media marketing plan; set up policies to manage a public social media account and the distribution of information. The first learning outcome was to effectively identify, monitor and respond to the community audience formed around the library’s social media by reviewing post and audience response on social media platforms, Facebook & Twitter and attend the reader’s advisory meetings virtually. The first half of this learning outcome was achieved through daily monitoring of SCCLD’s Facebook page and Twitter account (See Appendix item 1 for clocked hours). Through my monitoring I learned what posts were most popular on Facebook, the time in which users frequented the page most often and as well as what posts reached the largest population (see Appendix item 2). The constant monitoring of Facebook allowed me opportunities to see what types of things the “fans” enjoyed seeing the most. This allowed me to recommend specific types of posts for staff to focus on to encourage more interaction on the page. Monitoring the Twitter account was less insightful as the audience focus was less targeted, this became a recommendation item on the social media plan I put together. I used the opportunity while monitoring Twitter to find more community to follow, to communicate with those who tagged SCCLD in tweets. This received good feedback, one individual stated, “@sccld You’re awesome! Great job with the social media!” (See Appendix 3 for full conversation). The second half of the SLO, attend Reader’s Advisory meetings, was later dropped by the internship supervisor due to scheduling constraints on both parties . Any information pertaining to my responsibilities as the intern was relayed to me by my supervisor. The second learning outcome was to learn and practice best social media practices through hands on use of platforms, including scheduling posts and daily interaction on forums to increase traffic on SCCLD’s social media platforms; including Facebook & Twitter. This SLO was achieved through research, daily interaction of SCCLD’s social media platforms and volunteering to post on the Facebook feed weekly. For research, refer to the bibliography page for a listing of articles that were used in shaping the focus and evolvement of SCCLD’s social media. Traffic for SCCLD has increased; the follower count for Twitter has grown by 29 followers since the beginning of the internship and Facebook has increased by almost 80 “likes”. The biggest accomplishment SCCLD saw over the past 3 months was hitting the 1K milestone, 1,000 page likes on Facebook, without the use of a Facebook campaign. At the beginning of the internship period, SCCLD was looking at 927 likes by the end we were up to 1,006 likes (see appendix item 4). Through research and recommendations, the staff began posting content that sparked more interaction from our fans. The interaction provided greater opportunity for our Facebook page to be seen and receive more likes. Another opportunity that came from monitoring Facebook daily was the opportunity to answer a reference question and turn it into a very positive experience. A patron made a comment on a post on Facebook and I responded to her comment, which then sparked this reference opportunity. This patron desired that a certain book be available on an audiobook service that SCCLD subscribes to. I found that although the service did not have the book, that the book was available on disc for checkout from the library. The patron was ecstatic about this revelation and left very happy. The interaction between myself and the patron is publically visible and created a positive experience that others can read and gain more insight to SCCLD. This SLO required that I take the knowledge I gained and formulate a social media plan and set up policies to manage a public social media account and the distribution of information. The SLO was accomplished through 135 hours of research, hands on practice and incorporation of best practices. This was a difficult task to accomplish, as it required viewing each platform; see footnote for link to full social media plan. Along with the social media plan, Megan and I put together a best practices document that listed key bullet points for each platform about posting and things to keep in mind while managing the platform. For example, Twitter only allows 140 characters in posts, only use 120-130 of the characters so there is room for followers who want to retweet or quote your tweet. Another example is to always use the #SCCLD in Tweets and Instagram’s, this will help make SCCLD more searchable in the platforms. My internship experience with SCCLD was very positive. My supervisor exhibited a democratic management style where we each collaborated on ideas and together chose ones that fit the model we were working towards. This method of management was very effective as it allowed and encouraged innovation. I would recommend that there be more insight from the managing side to help better guide the focus of the organization. This would have been more helpful because I was an outsider to the organization. One thing I found was that SCCLD was very strict into adhering to statement II of the ALA Code of Ethics that reads, “We uphold the principles of intellectual freedom and resist all efforts to censor library resources.” One example of this was a user posted a quote on the SCCLD Facebook page that contained the F word. The user did not censor the word in the quote; however SCCLD policies enforce that staff does not censor comments made on public platforms as it is a violation of patron’s right of speech. Although my instinct said to “hide” the comment as to not offend those who read the post, I knew that the policy was not only enforced but was also in accordance with the ALA Code of Ethics by which I, as a current ALA member, established I would do my best to uphold. My main priorities were developing the procedures for different platforms and researching best practices. My site supervisor broke down each month’s priorities based upon what was accomplished and learned in the prior month. One action item that stayed continuously on the menu was finding a way to gain better awareness on Instagram and to use it to promote the library. The action plan was of great help to keep priorities in view; and I recommend that it be a best practice for future SCCLD internships. The most difficult aspects of working in this [virtual] environment was connecting with the library. Due to schedule constraints I did not get the opportunity to participate in the Reader Advisory meetings and in part I felt like this created a gap between me and the staff. I wish the staff would have reached out to me more to give feedback or insight on how they are currently using social media; however I could have encouraged this more by sending out emails and interacting with them more. I think this was a difficulty primarily because this was a virtual internship and had I been on site my interaction with staff would have been satisfactory. Throughout the internship I used a variety of technology to accomplish the tasks set before me. I used email, Google Docs, and the Virtual Library Wiki for collaboration with my site supervisor as well as some staff at SCCLD. I used social media platform mobile applications for iOS to manage SCCLD’s accounts including; Twitter, Facebook, Pages, Cubenect, SCCLD mobile site app, WordPress, and Instagram. I also used the full website pages for Twitter, Facebook, WordPress & sccl.org to manage these same accounts. All tasks were easily accomplished through these forms of technology and I do not have any recommendations for improvement. As I made my way through this internship program I found myself grateful that I had taken Libr246: Social Media & Web 2.0 tools. This course, although only briefly, provided me with an overview of how some libraries used social media. It also introduced me to some of these libraries that had great examples, such as NYPL, to refer to during my research. I also found myself referring back to information I learned in Libr210: Reference and Information services, specifically Reader’s Advisory services. The reader’s advisory will be incorporated through Facebook posts, Pinterest boards and library blogs. These ideas were introduced to me through Libr210. Although I have a strong background in social media, these two courses introduced me to aspects of the library that I may have over looked during my research, specifically the use of Pinterest in the library. Equally, I would have been better equipped had I taken course work on censorship and public libraries. This internship was my first non-patron experience in a public library, so many rules that exist in a private academic library in regards to censorship are forbidden in many public libraries. I am a firm believer in not censoring however it is still an area I do not know much about. I also think course work in library marketing would have helped me in the long run as a put together the social media plan. I am confident in my work but I know that having a formal foundation in library marketing would have saved me time as I set up action items for the social media plan. I feel that this internship exposed me to opportunities and experiences that helped me more fully understand the impact social media can have on organizations. Although the work I performed during this period seemed insignificant in process, when put into the bigger picture I realize that this helped structure SCCLD’s social media presence. The social media plan will be a basis from which SCCLD can build their policies and procedures; this is of significant value to the organization. Working with SCCLD has helped me form a more professional view of social media and how I can now use it to my advantage in advancing my career. I have a solid understanding of Facebook, as well as the ability to create and implement Facebook campaigns for other organizations with which I may work. I can state that my internship at SCCLD was a rewarding experience and I will take from it a significant amount of primary evidence as well as a new perspective on using social media in libraries. Santa Clara County Library District. (2013). Social Media Policy [PDF]. Retrieved from Santa Clary County Library District Staff Wiki (private access). The use of mobile applications was not a requirement to accomplish my responsibilities; their use merely provided convenience and all tasks could be accomplished through the web browser. “From its earliest days, the true power of the Internet lay in the ability of the network to enhance communication” (Farkas, 2007, xix). With the introduction of the internet not only has communication ways changed but the way we access information has changed. Before the web, information was accessed within highly structured systems with which librarians knew best how to navigate to these structures and databases to find information for the user. This was a well-known need for a librarian. With the implementation of algorithms and spider crawling in web search engines such as Google and Bing, navigating these systems and finding information, albeit maybe not be of highest quality, has become common knowledge to the 21st century user. New technologies and the digital age have forced libraries to reevaluate their function and role within the society. Libraries will not disappear, as many suggest instead they will thrive as long as those within them evolve and adapt with new technologies. One major impact of technology is the ability to navigate our resources remotely, many of our patrons are no longer needing to come to the library and that’s okay. However, this means that we must go to where our patrons are, social media platforms. We want to communicate with them, learn about what they are interested in, what they want to “get” from the library. It is imperative that libraries develop an online presence and make themselves available remotely, as we do with our resources. This means that we as information professionals need be cognitive of how to use these technologies such as Facebook, Twitter, Pinterest, Instagram and Flickr. Beyond communicating through social media avenues we also need to be able to serve our patrons by being proficient in current and up and coming technologies. This includes physical hardware (e.g. tablets, eReaders, smartphones, and mobile devices) but also software such as cloud services (e.g. Google Drive or Drop Box), presentation services (e.g. Prezi, Glogster), collaboration services and webpage building services. The library will continue to be the place to look for the newest New York Times best seller but on top of that we will be the place to try new technology and develop innovative software, a prime example of what libraries will evolve towards with technology is North Carolina State University’s state-of-the-art library, The Hunt Library (http://youtu.be/BzL8MHbBtiY). I introduce the Hunt library for multiple reasons. First, it touches base on the funding and cost of technology implementation. Funding, budget cuts, short staffed are all unfortunately common terminology within information professionals. The design and building of the Hunt library cost a significant lump of change, $115 million to be exact. Technology is not cheap, especially when you are expected to offer it to your users, it is the new norm. Library administration will be spending a significant amount of time on funding technology adaptation and less on budgets for collection development. Second, as you learn about the technology that has been put in place at the Hunt library; the collection is only 1.5 million books and housed in a Robot-driven BookBot storage and retrieval system which uses only about 1/9 of the space that was used when storing the books on shelves. The bot retrieves book request via a computer click and within minutes; the technology not only saves space but time as well. The space that has been freed up from the stacks has been honed in on collaboration, technology creation and innovation and maker-spaces. I mention these facts because the core vision of the library was to provide the “ability for our students, faculty, and partners to immerse themselves in interactive computing, multimedia creation, and large-scale visualization” (Hunt Vision, 2013). This is what library spaces will evolve to, because of technology. The first piece of evidence I have included for this competency is the link to the JPG files of a library brochure I created at a prior library using Photoshop [LibraryBrochurep1] [LibraryBrochurep2]. I chose to include this piece of evidence to show that I understand the importance of knowing new technology and using it within your work place. This is but one software application that I know, but it is a very common and highly sought after skill by patrons. While I was working as a Library Director, I wanted to create better digital resources and more aesthetically pleasing library material so I learned the basics of Photoshop and have gradually taught myself more techniques and am able to teach others the basics of using this software. I know that because I was willing and desired to learn this software that I have a very useful skill for our profession as we move towards more digital resource development and web design. The second piece of evidence I included is a link to a [Prezi presentation] that I created for an information literacy course at a previous job; this piece is included in a folder because there are data files that need to be contained with the presentation in order to view it offline. When you open this file which I have shared using the cloud storage DropBox, you will need to open only prezi.exe to view the presentation. I included this piece of evidence to demonstrate my mastery of using technology tools to produce a presentation for a library workshop. Also, by sharing it through my cloud storage DropBox I have also demonstrated my ability to work with the newest form of storing files on a cloud service. The final piece of evidence I have included here is a [screen shot of my web portfolio] & included a [link to the webpage] that I built. This piece of evidence shows my understanding of digital recourse and using technology to communicate to remote users the information that I want to share with them. Although this is a personal page, it support the ultimate goal of the library which is to provide access to information to our users. This piece of evidence also shows my mastery in the skill of web design and creation which is highly sought after in libraries as their online presence is the most important aspect of their marketing and advocating their use. These technologies: BookBots, collaboration tools, social media interaction, and software for program creation, web design or photo editing will be things that we as information professionals should know the basics of. If we want our users to use these tools then we need to know how to teach them or help troubleshoot basic problems. Libraries will become information and technology hubs and less book storage. Farkas, M. G. (2007). Social Software in Libraries: building collaboration, communication, and community online. New Jersey: Information Today, Inc.
As I begin my wrap up for this internship I get to reflect on what I did, what I learned and would I change anything. I have spent a great deal with social media, primarily Facebook and Twitter. I have watched as our Facebook posts grow in views and drop in views. I have watched as we continue to increase our interaction the likes on our page go up. I believe we will hit out 1K like before the years end, without campaign. I have learned that the business aspect of Facebook is very time consuming and if done well also complicated. We use our personal pages to share our thoughts and we are happy when people like our page. From a personal aspect, my page is private but this is the recipe for disaster for any organization. One thing is at a personal level use Facebook to connect with old friends, family, loved ones, etc. We use Facebook to share our feelings (some often too much). As an organization Facebook is another faucet for customer service and advertisement. We are there to build our brand, to connect with our customers and to build our following. Although essentially they have similar goals, on a personal level we don’t track when our friends see our posts or what posts get the most likes, etc. However, all of this is something that should be tracked for businesses. Facebook insights help with gathering the data but understanding it is up to the page managers. This is a portion of the complicated and time consuming part of Facebook for your business. Advertising on Facebook is also very important for businesses, at SCCL we are working towards building a campaign for a library service such as TreeHouse. Campaigns are much more complicated than they seem. You can read my post here about Facebook Campaigns. At first we were going to do a campaign for 1K likes but as we dove into the nitty gritty we realized that we wanted to use the campaign for something more “beneficial” like adverts for the newest and coolest software at SCCLD. One thing I would change is the Twitter interaction. I wish we could have nailed down the target for Twitter first thing because leaving it ‘up in the air’ with a semi-focus on businesses and community made the interaction very difficult. As I finish the Social Media Strategic Plan for SCCLD my key recommendation for Twitter is to develop a focused audience. This will help immensely with tweets and their content. Now, I’m not saying you have to have a specific focus, just a focus of some sort, don’t teeter between two and see which one comes out stronger. The joy about any business is your focus can change, it isn’t set in stone, as goes for your Social Media presence. The internship isn’t over yet, we’ve got one week left to accomplish some big tasks. Look for next weeks post on my final report. As librarians or para-professionals or circulation clerks, the list goes on, we have our fair share of dealing with irate patrons. We have the patrons who just want to be heard. The patrons who complain about dust on the keyboard. The patrons who just patronize…yeah, I went there. How do we handle these verbal complaints? “Kill ’em with kindness” “Give ’em a listening ear” “Ignore them [wait what?! ]” Our reactions to these situations are more/less second nature (if you’ve been working for more than a month in a library). Depending on the patron these complaints usually take place in a quite/semi private 3′ area about the desk between you and the patron requiring that you work one on one with the patron. What about handling a complaint that someone megaphones from the roof tops in the middle of a HUGE city parade? How do you handle that? It becomes a bit more ‘messy’. Similar to handling a negative online comment. The viewing audience is now millions/billions? more than the verbal-across-3-foot-space complaint. So how do we/you handle it? First and foremost, you respond. If you don’t ‘speak up’ you are not defending yourself and thus giving the complaint merits to be true. Make sure you respond with a thoughtful and positive tone, don’t feed the fire with fire. In your response I also recommend that you remove the complaint from the public eye. Encourage the user/patron/customer to contact you personally (Direct Message, Email, etc.) 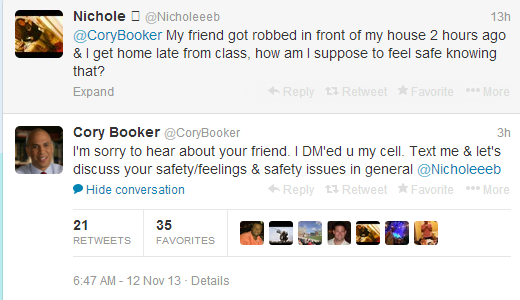 A good example of this is Cory Booker’s (New Jersey Mayor) twitter feed. I have been given the task of developing the procedure/plan/integration of using Instagram at SCCLD. 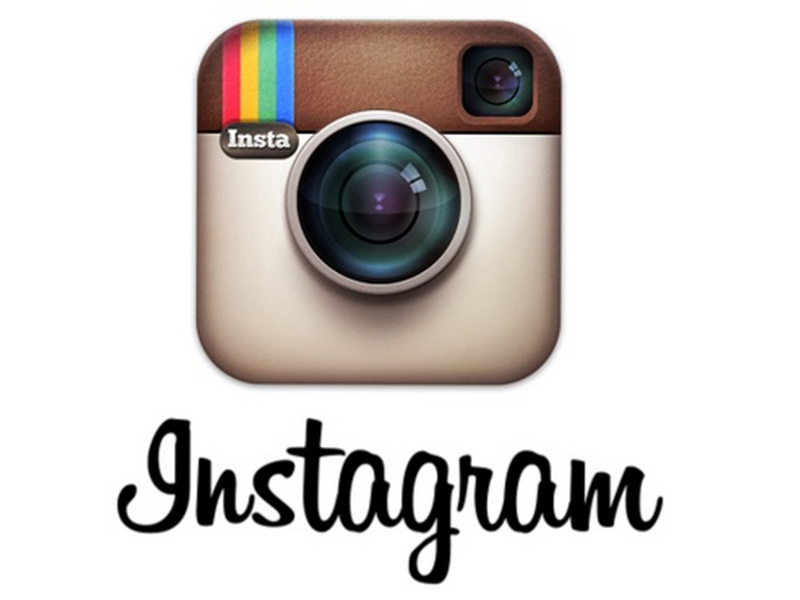 For those of you who live under rocks, Instagram is an application available on both Android & Apply phones. The people at Instragram describe it as: a fast, beautiful and fun way to share your life with friends and family. I’d describe it as an app used specifically for photo (& now video) sharing. This app can be linked (as most others) to share parallel to Facebook & Twitter. It also recognizes hashtags & account tagging (how else do you get to shame your friend with the candid snap of them sneezing, no really! ); this is all relevant information to note. So we want to incorporate Instagram and we want to come in with a BANG! so we are going to make our first big attempt at a photo contest. We know we will use the following: Hashtags (#SCCLD & #[whateverwedecideonforthecontest], tagging (@sccld) & we want to focus on library programs. Other questions we need to answer include: How do we announce it? When do we announced? and How long do we let it run? Without rehashing what has already been said by others here & here. FYI: Hashtags started with IRC (internet Relay Chat) and programming for denoting topics/groups, Chris Messina took the idea and implemented it in Twitter. The use of hashtags became increasingly popular and useful; this lead to the adoption of their use by Instagram & Facebook (as a form of tagging topics) – why do the hashtags matter? If you still live under your rock, this is why #hashtags are important. However it is important to note what Davis said earlier, Hashtag within reason 2-4 relevant per post Hashtags is acceptable. Patron (name not given for lack of permission): I wish you guys would have more audio books!!! I loved listening to the help while I cooked dinner and cleaned house!! Audio books are such a joy! Patron: Yeah. That’s where I get the audio books from. I really really wish they would order Gone with the wind!!! Patron: Thank you!!! I’m going to go order them right now!! Thank you thank you thank you!!! Patron: I most certainly will!!! How do I submit an application for a book order request? Gone with the wind has a sequel called Scarlet. I would love for Santa Clara County Library to carry it! It would be greatly enjoyed by those who love Gone with the wind as I do! Through this conversation we went from complaint > resolved complaint > advertising of services > hearing the patron > helping the patron find what they need/want > use of services by patron. This conversation had so many elements to it, I would soundly say it was the “perfect” librarian conversation. Best part, it is public. Others will see the Q & A interaction (positive feedback) and learn from it and I didn’t have to repeat it 20 times to reach them. Facebook served a great purpose and allowed for this interaction to take place. Currently we are |this| close to hitting 1000 ‘likes’ on our Facebook page. The likes still come in during the week but on an average of about 3 per week. At this rate we will be into the new year before we hit 1K; that isn’t our [SCCL’s] idea of ending on a bang, more like a pfft (think poorly executed whoopee cushion prank). What are we going to do? We are going to campaign for your likes, but how? That’s my job. I get to figure that out and I have NO IDEA how to develop a campaign on Facebook. Fortunately, we have the interwebs to help. Yes I did it, I googled “creating a Facebook campaign”, you can do it too I won’t judge. I came across an article in Social Media Today: How to Create a Perfect Facebook Ad Campaign, author: Mitz Pantic. This article is nicely written but please keep in mind that it is a general guide (10 tips) and some of it isn’t 100% applicable to libraries. So here is my plan, execution will come later. Creating your ad. Pantic recommends 5-10 ads to rotate, seems high but I’m new so that could just be naivety on my part. Creating the ad is the MOST important part because its what you will be ‘saying’ to those who see it. What message are you going to convey? Find out when your audience interacts with your posts, this will help gauge the right time for your ads to ‘circulate’ around Facebook. If your audience is predominantly on Facebook around 1pm, don’t have your ads circulate at 8am. Capeesh? So there you go, that’s my plan and I am sticking to it.